I come from a long line of over-the-top party throwers. Seriously - I've thrown fondue melt offs, Moroccan parties complete with a tent and a sultan throne and, then there are the Mad Hatter Tea Parties with roses to paint red and drink me bottles. I don't mess around and neither does my sister who excels at making large quantities of intricately designed baked goods. I found this watermelon shark on Pinterest and it is simply fabulous. Look at the little melon fishes in his mouth. The intricate detail of the teeth. The beady little eyes. I smell a project coming on. 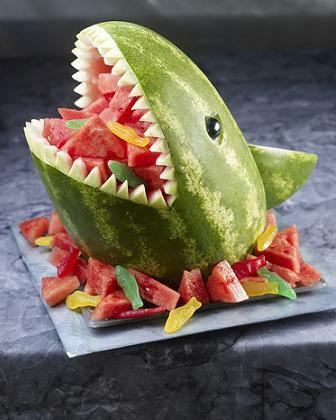 This fishy dish would be perfect for the 25th anniversary of Shark Week, which starts July 27th on Discover Channel. You now have plenty of time to prepare. The top 100 shark facts are here. Start memorizing now to impress your favorite eight year old.